Teachers attending the Amgen Biotech Experience workshops at Shoreline Community College get hands-on practice with both sides of the lab - wet and dry! Dr. Dina Kovarik from Digital World Biology has been busily engaged this summer in the Amgen Biotech Experience (ABE) program at Shoreline Community College.The ABE program gives teachers a way to learn and practice biotech lab skills like micropipetting, agarose gel electrophoresis, PCR, purification, and cloning. 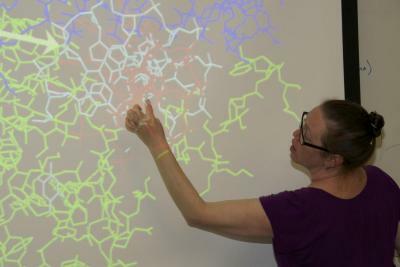 Thanks to Kovarik, teachers are doing a bit of bioinformatics as well. They're learning about similarities between structures of Green Fluorescent Protein in apps like Molecule World and learning how proteins get information out of DNA with the Molecule World DNA Binding Lab. See the wonderful page that Dr. Kovarik put together on Green Fluorescent Protein and it's variants to find structure files that can be downloaded and viewed in Molecule World. Dr. Kovarik where the restriction enzyme BamHI clamps on to DNA. BamHI is one of the structures included in Molecule World. Investigating how proteins bind to DNA. 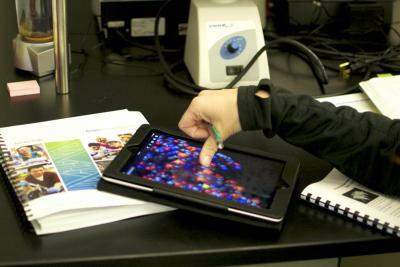 Molecular structures at the tip of your fingers. 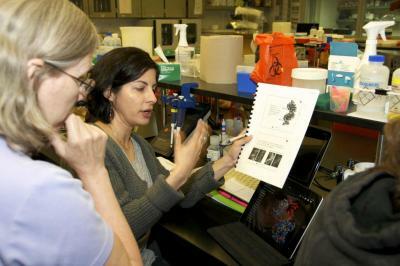 Discussing ideas for improving on the Molecule World DNA Binding Lab. 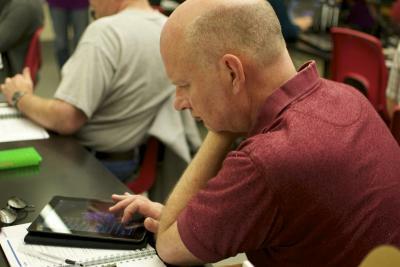 Students can already capture images from the DNA Binding Lab and post them in blogs or paste them into lab reports. A new DNA Binding Lab worksheet and glossary give teachers more options for assessing student work.